Tyson Barrie. One of the two young offensive minded defensemen in the Avalanche system that made it seem like it wasn’t going to be such a big deal when the Avalanche traded Kevin Shattenkirk to St. Louis. He has all the tools that you would want from a puck moving defenseman; speed, skill and a good shot. Yet, even with the tools necessary at his disposal, Tyson Barrie is coming up woefully short of expectations. Don’t get me wrong, Barrie has his moments. He is often joining the rush in the right moments, helping the Avalanche do what makes them the most dangerous, pushing the pace. That’s exactly the kind of thing you want from a defenseman that is supposed to produce points for you. You want a guy who can turn a harmless 2-on-2 situation into an odd-man rush. The guy who can sneak in from the point to create a surprise situation for the defense and the goalie. Tyson Barrie can do all of those things and he usually does them pretty well. The only problem is that all these good things that he does do have become sporadic at best. In fact, it seems that the most consistently good games we get from Tyson Barrie are the three or four games immediately after Barrie gets called back up from the AHL. The issues that come with Barrie then begin to pile up. Size is not something that is ever going to work in Barrie’s favor, as anybody can see that he is a smaller guy. The biggest problem with this is it leads to Barrie being very vulnerable in his defensive zone, especially against stronger, more physical players. That is one of the things that has gotten him less ice time over the past couple of seasons, the way he can be physically dominated at times. Last season, after a game where Barrie was abused by Patrick Sharp, he ended up being sent down to Lake Erie. Earlier this season, Barrie found himself a healthy scratch and sent back to Lake Erie again for many of the same reasons. Bottom line, in one-on-one situations, especially against bigger more physical opponents, Barrie is a liability in his own zone. Barrie’s decision making can also be very suspect. A couple of times in the past week, Barrie has made lazy and foolish attempts to clear the puck from behind his net around the boards that were intercepted and immediately turned into big scoring chances against. Sometimes, his aggression also gets the best of him, as it did in Colorado’s 8-2 beat down at the hands of the Edmonton Oilers. Just as the Avalanche had gotten back into the game, they found themselves in a 4-on-4 situation. Barrie made a decent pinch, but took an ill-conceived shot that completely missed the net. Barrie was late getting back and left his partner alone on a 2-on-1 against that ended up in the back of the net. It’s maddening to watch, because Barrie is a gifted player, and he is able to show it from time to time. He just can’t seem to string things together for any type of extended amount of time. Kevin Shattenkirk was traded away because the Avalanche were sure that Stefan Elliott or Tyson Barrie, or both, would be able to provide the same type of production. The truth, however, is that Barrie’s production has left a lot to be desired. 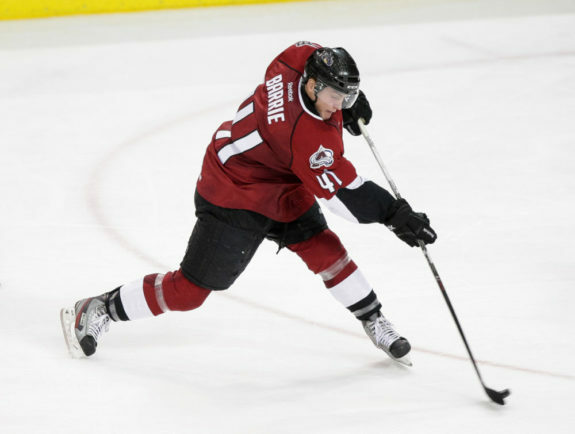 Barrie has played in 56 games for the Avalanche over the past three seasons. In those 56 games, Barrie has two goals and 14 assists for a total of 16 points. Just to put that into perspective, in the one season Shattenkirk played with the Avalanche, he played 46 games before he was traded. In those 46 games, Shattenkirk had 26 points. He also had 17 points in the 26 games after he was traded to St. Louis. Barrie’s production is just not living up to what it needs to be if he is going to be the replacement for Shattenkirk. Some of the staunchest Barrie defenders will point to Barrie’s Corsi rating as a reason that he is a valuable asset to this team (Corsi explanation right here). The essential argument being that, when Barrie is on the ice, the team gets more shots on goal. Now, yes, having more shots on goal when a particular player on the ice is a good thing, nobody can deny that; but with Barrie’s not so fantastic point production, it’s clear those shots aren’t exactly leading to goals. I’m not a huge proponent of Corsi as a statistic that will judge how valuable a player is to a team. My case and point is as follows, last season, Shane O’Brien was widely ridiculed by Avalanche fans. In fact, it seemed to be a majority opinion that O’Brien was the worst defenseman on the team not named Matt Hunwick or Greg Zanon. Yet, Shane O’Brien led the Avalanche in Corsi rating last season with a +8.05 when he was on the ice. So, yes, there is a certain value to being able to see a certain player brings some decent offensive possession to your team, as Barrie does when he is on the ice. But, when you see that he’s also top 10 on the team in giveaways, and is currently ranked behind Patrick Bordeleau offensively that it might not be the best stat to use to judge him. Barrie’s job is to help put up points for a team, and he simply isn’t doing it. There’s a couple of options that you could look at with Barrie and you could make a compelling point for all of them. First, take the long term approach. It’s currently what the Avalanche are doing with Stefan Elliot, Duncan Siemens and Chris Bigras. Send Barrie back down to Lake Erie and give him lots and lots of minutes. He’s had a lot of success in the AHL and seems to come back strong whenever he does go back to Lake Erie. So give him the rest of the season down in Lake Erie and let him hone his game a bit more so that you can be sure he will bring some more consistency with him when he does manage to get back into the NHL lineup. Second, stick it out. Barrie has been up and down between the NHL and AHL over the past couple of seasons and that can have an affect on a player. You never really settle in to any of your teams and it’s hard to get into a rhythm. If you want Tyson Barrie to be an NHL defenseman, then keep in the NHL and let him be what he’s going to be. Option three, trade him. Since Barrie is still very young and has only played in 56 NHL games, there would still be a market for a player like him. There was a report that the Avalanche and Panthers had a trade in place for Dmitry Kulikov, and it wouldn’t have surprised me one bit if Tyson Barrie was a part of that deal. Now it apparently didn’t happen, but it still wouldn’t be a big surprise if Barrie was being shopped. Between Tyson Barrie and Stefan Elliott, Barrie has the highest trade value right now. If you could get the right combination of players, Barrie could make a very strong piece of a trade puzzle. With the amount of injuries running on the Avalanche right now, it’s really hard to predict what might happen. I can see Barrie being traded to get some stronger help on the blue line as the Avalanche weather the injury storm. I can also see the Avalanche sticking with Barrie for a while longer because he knows the system they are trying to run and it would be easier than trying to break in another player. If I had to bet on it, I’d say the Avalanche will keep Barrie around until some of the injured players start to get healthy. Whatever they do, Tyson Barrie needs to pick up his play.